I love going to the Fashion and Textile Museum. Its located in a nice area near London Bridge station and its so nice and cosy that I enjoy every visit. The museum doesn't have permanent exhibitions because of the lack of space, but every two or three months they set up very interesting exhibitions regarding fashion. This time its the Riviera Style! An exhibition that celebrates the clothes worn in and by the sea and focuses on how clothing design have changed since the late 19th century. 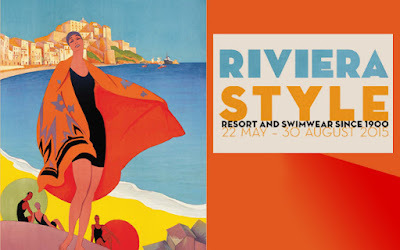 Wondering around the museum you have the opportunity to see what men and women wore in the 1900's in order to preserve their modesty and how swimwear has evolved through the years in terms of fabric and design. Modesty was not the only issue the designers of the time had to deal with. It was the issue of what fabric should they use in order to be well preserved under water. And that's central to the story of this particular exhibition. As the years went by and people found the benefits of the sun tan, the swimming costumes became less restrictive and more practical. Unless of course you are Coco Chanel and you go to the beach dressed like the picture above. Or you are Ursula Andress and you are starring in a James Bond movie so you don't really care if you are wearing a not practical suede swimming suit (like the one above). Over the last 25 years a lot has changed in swimwear. The relationship between swimwear and fashion developed and fabric technology has evolved so much that even provided speed-enhacing materials that have helped shave seconds off Olympic swimming records, just like the swimsuit that was designed for the British women's swimming team by Stella McCartney for the 2012 London Olympic Games (photo below). Overall this is a small and fun exhibition that definitely worth a visit.